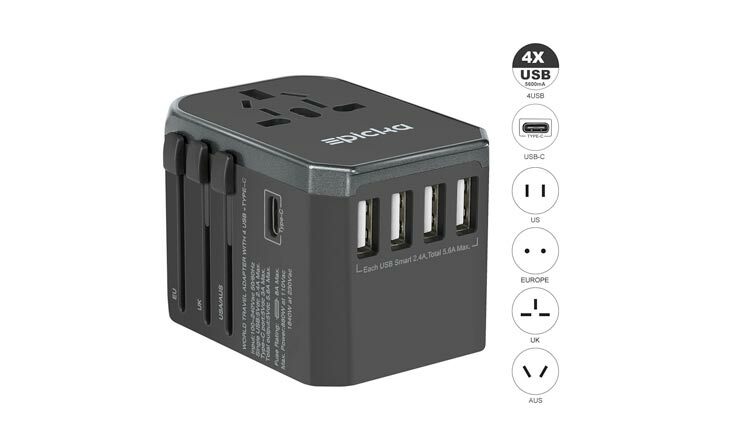 Not having enough space to charge your electronic devices at home or at the office or even abroad won’t be a big concern for you anymore if you have all these electronic travel adapter to use. Many people have encountered such problem and are looking for solutions just like you. Hence, in order to simplify all the difficulties and to ease all your daily problems, we have collected you numerous flexible electrical adapters and we hope it will help you dealing with all the concerns. 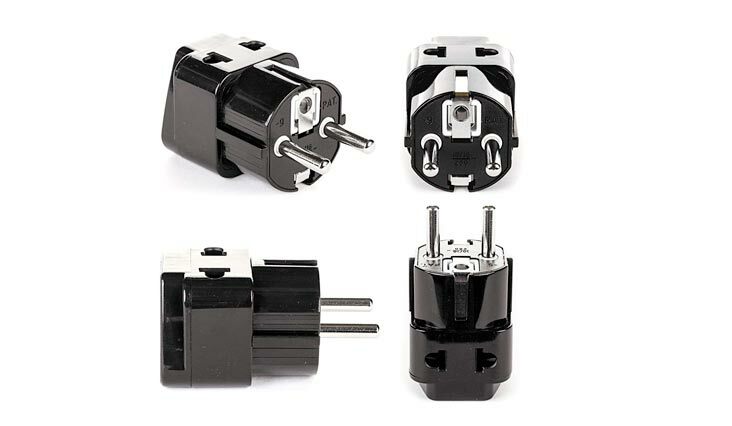 Having this black grounded universal plug adapter with the patented universal receptacle design that accepts plugs from most countries including the US and Canada is very important. The ‘Type E /F’ plug adapter is grounded and fits in to Shucko outlets in countries such as Germany, France and more. It has various key features that will offer a lot of benefits including US patented universal input that accepts plugs from all countries (except the Type M – big S. Africa 8.7mm Plug), output “Type E” or “Type F” that suitable for Germany, France, etc. Its new conductivity design with internal metal interfaces provides better conductivity. New insulated design – half-way covered by plastic, provides better safety protection, 10~16A/250V, 4.8 mm, 4.8 mm prongs. The insulated voltage offers 3KV, CE approved, RoHS compliant, and patented in 36 countries. This plug adapters do not convert voltage, they just change the plug type. Use a proper voltage converter along with a plug adapter if your device is incompatible with the country’s voltage. This CTU-6 adapter is a Type A which can be used in the following countries: Brazil, Canada, the Cayman Islands, Colombia, Costa Rica, Cuba, Ecuador, El Salvador, Guam, Guatemala, Haiti, Honduras, Jamaica, Japan. The CTU-6 features a standard US Grounded NEMA 5-15 socket which will accept the polarized or non-polarized plugs. It also features 2 smart USB ports that can support up to 2.1A. You may conveniently charge your USB devices such as smartphones, tablets, iPhone, iPad etc.. by simply connecting the USB cord directly to the USB ports on this adapter. You do not need to worry about the AC voltage for the USB devices as this adapter will output the 5V DC as required by your USB devices. Please note that these adapters do not convert voltage. Please check the voltage standard for the travel destination and use an appropriate voltage converter with the adapter if needed (for example, Europe uses mainly 230 Volts). Many electrical devices such as AC/DC chargers for Laptops, cameras, cell phones, iPhone, iPad etc. allow a multi range voltage (100-240 Volts) and eliminate the need of a voltage converter. Sometimes electrical device have a switch for either 120 or 230 Volts. Add versatility to your electrical outlets using the 3-Outlet Grounded Adapter with Easy Access. Converting one grounded outlet into three, the adapter adds more outlets where you need them most. Thanks to the adapter’s unique, easy access design, you can use the adapter on any grounded wall receptacle while keeping one of your outlets stay free and flexible at all times. Get more from your electrical outlets using the GE 3-Outlet Grounded Adapter with Easy Access Design. With this adapter, you can adds more outlets where you need them most. It can converts one grounded outlet into three and it is also has an easy access design. It is an adapter that designed for use with indoor outlets only. This travel adapter is engineered to refuel devices up to 4x faster than conventional charging. QC3.0 VS QC2.0: + 38% efficiency + 27% charging speed – 45% heat. It is a type-C Output Harness the full power of USB-C technology to charge your device faster. This adapter provides 5V/3A output, which is great to charge Nexus 6P, Lumia 950/ 950XL, Nokia N1 and other Type-c devices. It also consists of Smart Charging Technology Tuned to support healthier battery function and faster USB charging speeds, smart chip intelligently adjusts power output to match the unique charging needs of all your USB powered gear. With up to 2.4A of dedicated adaptive output per USB port, your devices will each receive the safest maximum recharge rate possible. The built-in smart security chip brings temperature protection, output over-current protection, output over-voltage protection, output overload protection, output short circuit protection, surge protection, automatic reset protection, under-voltage protection. For you and your devices safety. 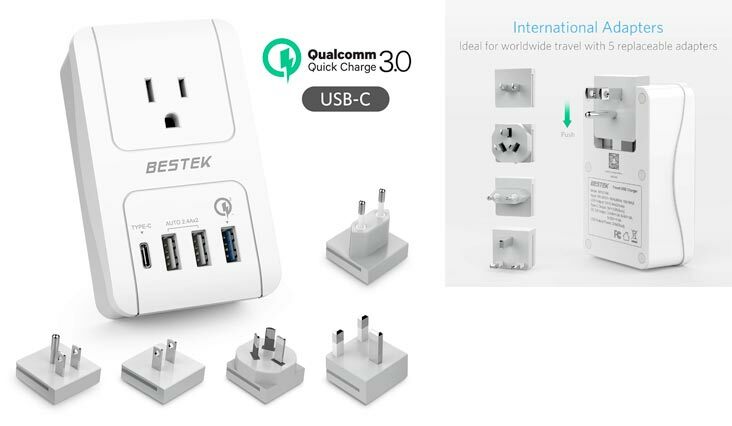 It has a Travel-Ready Design Compact size: 4.2 x 2.6 x 1.4 inches only with 5 international adapters ( US/UK/AU/EU/JP adapter) support outlets in North America, United Kingdom, Continental Europe, Australia, Japan, China etc, more than 150 countries all over the world. This travel adapter is engineered to refuel devices up to 4x faster than conventional charging. 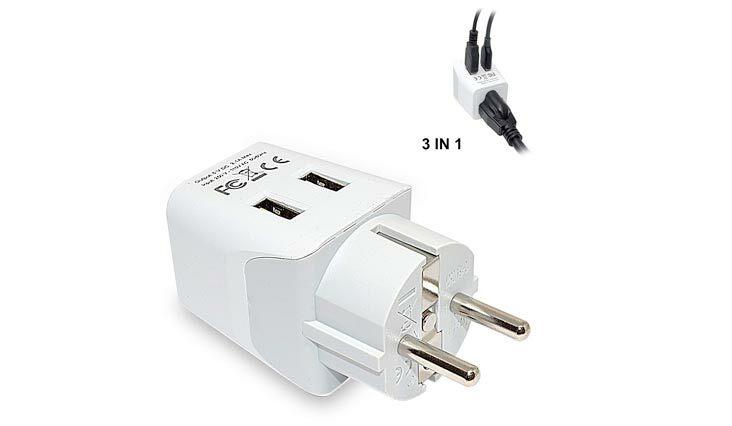 It is one European to American (two prong) outlet plug adapter that were Designed for use with the Wall Charger or VersaCharger PRO and when used with the VersaCharger PRO, the power outlet voltage must range between 100 to 220 volts AC. Many electrical devices such as AC/DC chargers for Laptops, cameras, cell phones, iPhone, iPad etc. allow a multi range voltage (100-240 Volts) and eliminate the need of a voltage converter. Sometimes electrical device have a switch for either 120 or 230 Volts. Having thus travel charger AU/US to EU Plug Adapter, you’ll never have any concern anymore. This charging adapter can charge your electronic devices while abroad with this AUS / US to EU adapter plug. 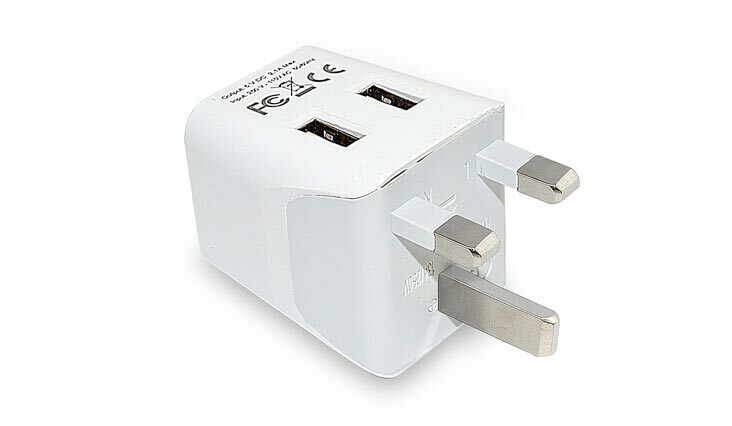 It can adapt your Australian / US devices to European electrical standards while traveling through Europe with this US to EU plug adapter. With this extra handy and light travel charger adapter and you can change any AUS / US plug to an EU standard plug. 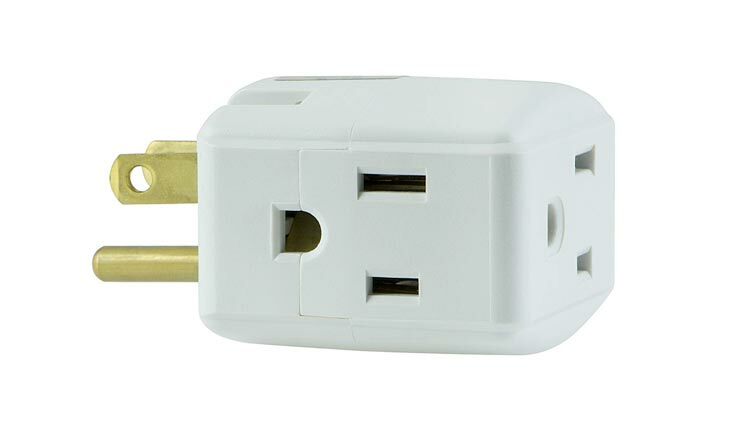 It is easily plug-in your AUS / US wall chargers into this adapter to convert it to a EU plug. The product names are trademark of listed manufacturer or other owners, and are not trademarks of eForCity Corp. The manufacturer does not necessarily endorse use of these products. This travel adapter is engineered to refuel devices up to 4x faster than conventional charging. The Round Pin plug socket standard is used in over 50 countries around the world. 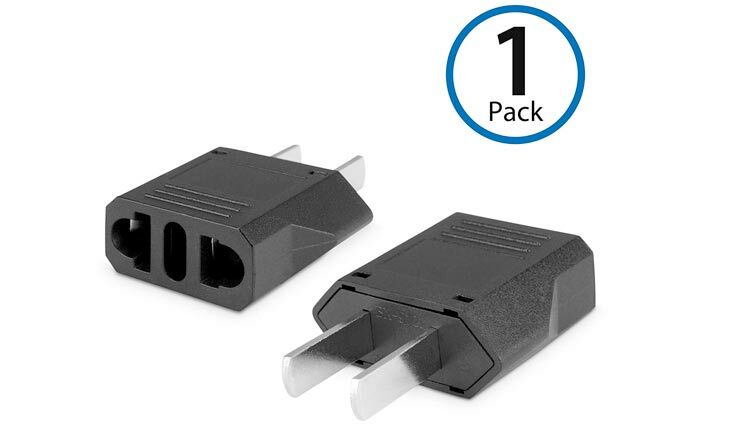 This is the E/F best adaptor for wall offers a reliable and easy connection for devices with a North American plug or polarized (one blade is wider than the other). The ultra compact size of this adapter makes it an ideal adapter for your travel needs. Works in France, Germany, Greece, Hungary, Iceland, Latvia, Lithuania, Luxembourg, Macedonia, Montenegro, the Netherlands, Norway, Poland, Portugal, Romania, Serbia, Spain, Slovakia, Slovenia, Sweden, Switzerland, Turkey , Ukraine, Albania, Austria, Belgium, Bosnia-Herzegovina, Bulgaria, Croatia, Cyprus, the Czech Republic , Denmark, Estonia, Finland. Please make sure that your Device supports 100-240V when traveling overseas in order to use with this adapter. It is designed in the USA & includes Limited Lifetime Warranty – Return it for any reason and we will replace it with a new one. 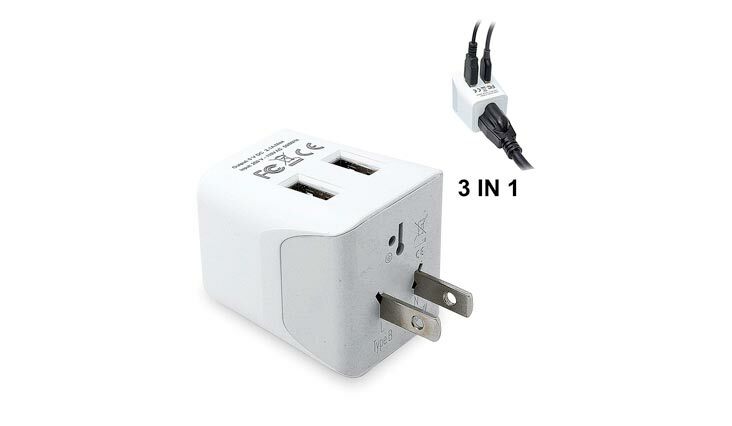 With 3 in 1 Input, it accepts the standard N American 2 or 3 prong flat pin plug (including polarized) – No Messy Universal Outlet + Dual USB Charges Upto 2.4A Ideal for iPhone, iPad, Galaxy, & other Chargers. It has an ultra compact Size & Safe that measures 1.5 x 1.5 x 2″ & Max Load Rating: 10-15A/250V, Round Pin Thickness – 4.8 MM. The Square Pin plug socket standard is used in over 20 countries around the world. 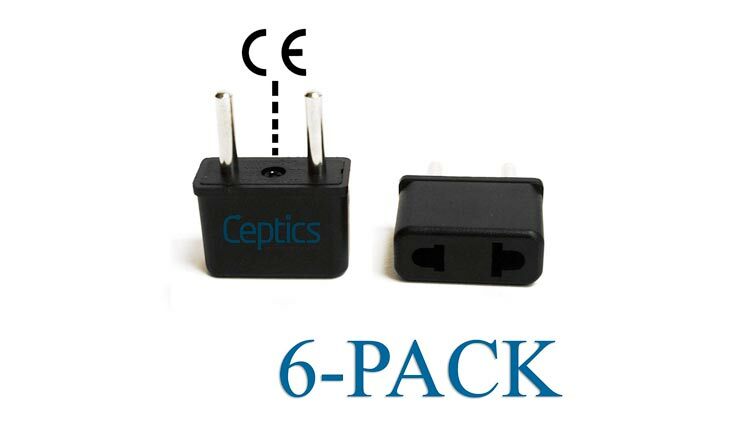 The Ceptics Type G England best adaptor for wall offers a reliable and easy connection for devices with a North American plug or polarized (one blade is wider than the other). The ultra compact size of this adapter makes it an ideal adapter for your travel needs. Works in UK, Hong Kong, Bahrain, Belize, Botswana, Brunei, Cyprus, Dominica, England, Ghana, Gibraltar, Grenada, Hong Kong, Iraq, Ireland, Kenya, Macau, Malta, Malaysia, Nigeria, Northern Ireland, Oman, Qatar, Saint Lucia, Saint Vincent, Saudi Arabia, Scotland, Singapore, Sri Lanka, Tanzania, Uganda, the United Arab Emirates, Wales, Yemen, Zimbabwe. Please make sure that your Device supports 100-240V when traveling overseas in order to use with this adapter. It is designed in the USA & includes Limited Lifetime Warranty – Return it for any reason and we will replace it with a new one. With 2 in 1 Input, it can accepts the standard N American 2 and/or 3 prong flat pin plug (including polarized) – No Messy Universal Outlet. It also consists of an Ultra Compact Size & Safe that measures 1.5 x 1.5 x 1.75″ & Max. 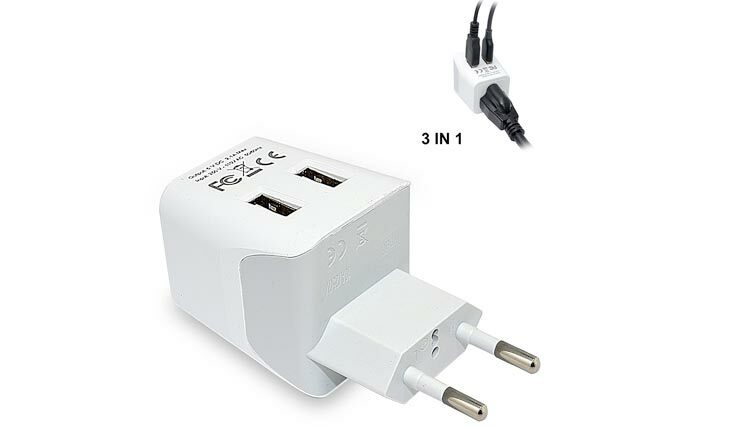 Having this worldwide charger All-in-one world travel adapter covers more than 160 countries with US/EU/AU/UK plugs, accepts a USA polarized plug(one prong larger than other one), the Universal 8 Pin AC Socket allows for the use of many different plug designs. It consists of a smart USB charging including Quad USB port and one AC socket to charge five devices at one time. Quad USB port with smart circuit can automatically charge most of devices including both iOS and Android devices which make it universal. ROHS, CE and FC Certified which safety. The safe shutter inside the socket is dustproof, Anti-Single Plug in and anti-electric shock. Includes spare fuse for . Internal spike and surge protection circuitry safeguards your valuable devices. This charger does NOT CONVERT electrical output current and voltage. Designed for iPads, iPhones, cameras, razor and other battery chargers, NOT for high-power appliances such as hair dryers, etc. This travel adapter is engineered to refuel devices up to 4x faster than conventional charging. It consists of a smart USB charging including Quad USB port and one AC socket to charge five devices at one time. Quad USB port with smart circuit can automatically charge most of devices including both iOS and Android devices which make it universal. ROHS, CE and FC Certified which safety. The safe shutter inside the socket is dust proof, Anti-Single Plug in and anti-electric shock. Includes spare fuse for . Internal spike and surge protection circuitry safeguards your valuable devices. This charger does NOT CONVERT electrical output current and voltage. Designed for iPads, iPhones, cameras, razor and other battery chargers, NOT for high-power appliances such as hair dryers, etc. In conclusion, you can now fulfill your desire to charge many devices at once with all these electronic travel adapter. All the products mentioned above consist of many advantages which includes back and side wired, ultra high speed power charging, UL certification stamp, wall plate included, easy installation, and safe lock protection function, international output plug type C, 3 in 1 input, limited lifetime warranty, and conductivity design. Hence, what are you waiting for? Go get each of these products now, otherwise you will regret.